Repetition has been the theme around here lately. And you'll see why in just a minute. In a nutshell, my life has been dialed into one channel - it's called the "you have a cookbook coming out" channel. There's a lot going on, and the more unmanageable my in-box gets, the more I find myself craving moments of mindless repetition. The more mindless, the better. 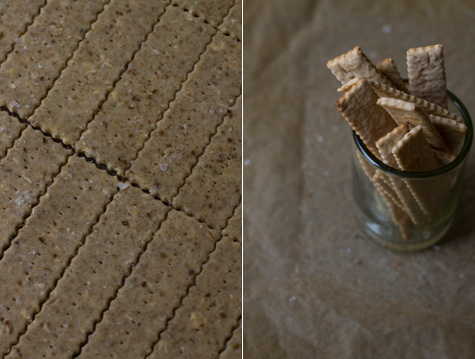 Roll-and-stamp cookies or crackers fit the bill nicely - like these oatmeal crackers. I've also started the process of assembling a thousand little postcard packets. I finish each one with a small piece of pink-striped tape, and I swear, I smile inside when each pack is completed. Simple pleasures. The postcards came about as I started thinking that it would be nice to have a little something on hand to give to people who make the effort to come out to a signing, or to give to friends I bump into out and about, or to mail to all the people who helped me test recipes. The guys at the print shop up the street from my house helped me make four different postcards, each featuring a different image from the book. I ordered a box of flat glassine bakery bags, a self inking stamp, and picked up some paper tape in Japan Town. As far as the postcards were concerned, I kept it simple - image on one side, then all-white back with a tiny super natural every day logo, and the words "stamp" and "postcard" micro-small. I wanted the bags to show a hint of the underlying image through them. Come to think of it, I wish they were a bit more transparent, but they work well enough. A semi-transparent kraft bag was another direction I was thinking about, but I had a hard time finding a good source with volume. So, I've been making postcard packets. And at the same time, I've been thinking about crackers. I like the recipe for Oatmeal Crackers in The Great Scandinavian Baking Book by Beatrice Ojakangas. I thought I might make them as part of a lunch menu I did for an event with Little Flower School and June Taylor yesterday. I'd top them with a spread (of some sort) in place of crostini. Well - I ended up doing the crostini from Super Natural Cooking instead, but I like these crackers enough that I wanted to share them. I have some tips and tricks I've come by to make them extra good. The concept for these crackers is straight-forward. You make a pot of oatmeal, combine it with rye & all-purpose flour and a few seasonings. Then work it all into a dough. When these crackers are at their best, they are full of toasty oat flavor, hearty and substantial. They are snappy not soft, and will keep for a week or more sealed tightly in a jar. But! To get them this way you need to roll the dough as thin as you possibly can. And then you need to bake the crackers to within an inch of their lives - dark, dark golden. Can you see how thin I've rolled the dough up above there? Work it even thinner if you can. You can cut the crackers into whatever shapes you like. And you can either bake them bumped up next to each other, or spaced out. I make strip shapes for cheese plates and spreads, and tiny animal crackers for my nephew from the scraps. 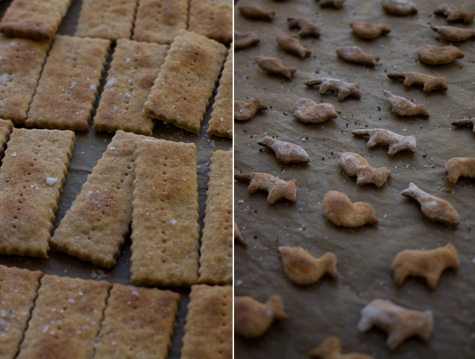 I tend to use fine grain sea salt in the crackers, and then a flakier salt sprinkled across the tops before baking. I grind my anise seed in a spice grinder. In a large bowl combine the rolled oats and boiling milk. Let stand until cool. To speed this up I sometimes place the bowl in the freezer for about 35 minutes. When cool, stir in the butter, sugar, baking powder, anise seed, salt, and rye flour. Stir in the all-purpose flour, a bit at a time, until a stiff dough forms. Turn out onto a counter top and knead until the dough comes together and is uniform. Heat the oven to 425F / 245C with racks in top and bottom thirds. Divide the dough into two parts, just so you have a manageable amount to work with. 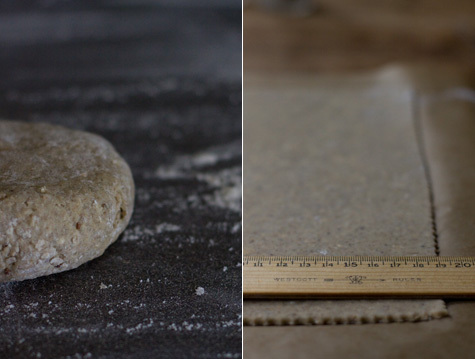 Now, you're going to want to roll the dough out very thin - 1/8th-inch. This way your crackers will have snap. Have a look at the photo up above, and try to get it thinner than that. If your dough is at all stubborn, just let it rest there for ten minutes or so, then try again. Transfer to a parchment-lined baking sheets [they don't spread much), and sprinkle with a bit more salt - flaky salt if you have it. Bake for roughly 14 minutes, but here's the trick. When the cracker bottoms are deeply golden, roughly 9 minutes in, flip each cracker, and brown the flip side as well. Use your best judgement and remove when well done. Cool completely before storing in large air-tight jars. Repeat with the remaining dough, and cut the scraps into tiny soup crackers. Makes dozens of crackers, depending on how large or small you cut them. Adapted from The Great Scandinavian Baking Book by Beatrice Ojakangas. A rustic oat soda bread you can make in less than an hour. Seriously. Made from a simple ingredient list of rolled oats, flour, baking soda, salt, and buttermilk. Love these - white beans pan-fried until they're golden, with kale, Parmesan, lemon, walnuts, and nutmeg.